See how much time you spend on tasks. Is there a better alternative to Done Time? Is Done Time really the best app in Personal Info Managers category? 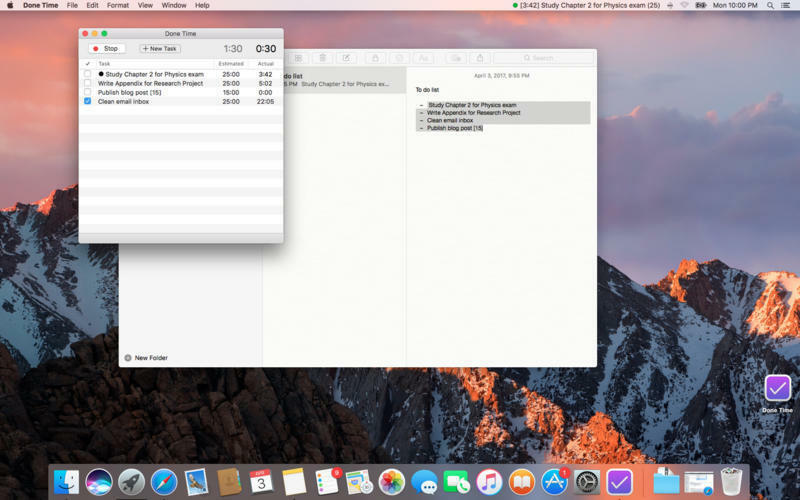 Will Done Time work good on macOS 10.13.4? Done Time allows you to see an estimation and actual time spend for each of the tasks on your list. You can start and stop the timer and switch active tasks. By default, each task comes with a 25 minute target estimation used widely for the Pomodoro technique. You can adjust this anytime. Simply use square brackets for minutes next to each task (e.g., Complete report ) When you copy paste your list to Done Time, each new line or new row will become a separate task with its own time estimate. Done Time needs a review. Be the first to review this app and get the discussion started! Done Time needs a rating. Be the first to rate this app and get the discussion started! In addition to the estimated time, the app allows you to run a timer to track the actual time spent. Once the task is active and the timer is on, you can track your progress by clicking start/stop in the top bar. Comparing how long you think it will take you to get something done to how long it actually takes can help you plan your tasks better each time. Once you mark a task complete, it moves to the bottom of your list for a cleaner look. Done Time is all about efficiency. With shortcuts, you can organize and delete unwanted tasks and export to save your progress in csv format.